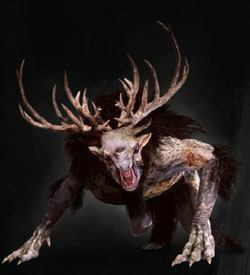 Fiend is a Creature/Monster in The Witcher 3: Wild Hunt. Fiends are walking mountains of muscle capped with horned, tooth-filled heads. Like their rarer cousins, bumbakvetches, they live in thick forests, swamps and bogs. When possible they avoid humans, but when not possible, they kill them, and without much difficulty." Weaknesses: Samum, Devil's Puffball, Relict Oil. You can use Enhanced Cat to be immune to hypnosis. Fiends are among the toughest of the tough enemies in the Witcher 3: Wild Hunt. Their large amounts of health, which regenerates over time, combined with attacks that are extremely difficult to dodge. 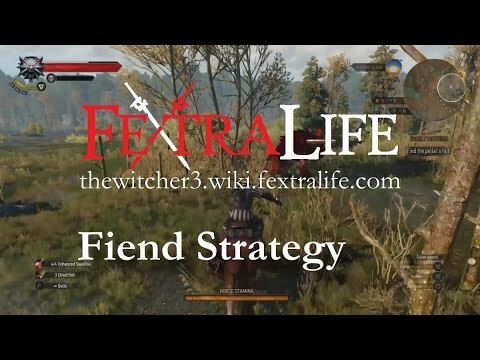 One of the things you can do to make this fight go a bit easier is engage the Fiend on horseback. It is relatively easy to deal high amounts of damage in a very short period of time with this method, you could even complete the fight this way if you so wished. Once dismounted or on foot you'll want to be aware of two attacks that are extremely dangerous. The first is his Hypnotize attack. If the Fiend remains motionless and the ground starts shaking, this is your cue he is trying to Hypnotize you. You can interrupt this attack if you are fast and hit or stun him when you see it happening, but if you fail the entire screen will go dark and you won't be able to lock on to him for 20 seconds. During this time I suggest dodging as much as possible until the Hypnotize effect expires. The second attack is his charge attack, which will all but one-shot you if it connects. Be sure to roll away from it. The general strategy with this fight is use Quen Sign to protect yourself from the Fiend's powerful attacks, use Axii to stun it when you want to deal some damage, protect yourself from a charge or hypnotize attack and bait him into attacking and hit him once and dodge. It is extremely difficult at lower levels and higher difficulties. If you have Relict Oil I suggest using it, along with a weapon with Bleed Chance. Igni is very powerful against Fiends. A good way to regain eyesight while blinded by Hypnosis is to use the Cat potion. It will render the picture black-and-white of course but that can be managed. Better a living cat that a dead wolf. Haven&apos;t beaten the game yet but really curious as to what a Bumbakvetche is and if it even exists IG. Anyone got info on it?